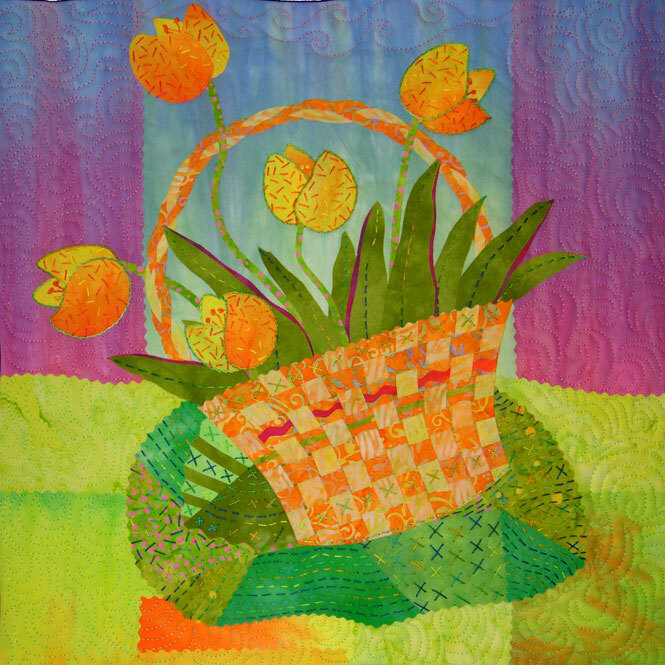 Create a colorful woven basket quilt full of joyful flowers and leaves. Learn fusing techniques like pattern transfer, bias weaving, and bias braiding for the basket handle. Pattern templates are provided, but you will also learn fusing tips and how to add hand embroidery to your small art quilt. Bring summer into your home and make a basket full of flowers from a kit of beautifully hand-dyed fabrics and threads. (No sewing machine is needed.) $25 Kit Fee. $25 Kit Fee: Includes hand out, templates, and hand-dyed fabrics. Basket quilts by students: Diane (left), Jeanette (top right), and Barbara (lower right).